The other major class of PFASs is the ‘non-polymers’; whilst not used directly on clothing, they can be used in the production and can be produced in the breakdown of the chemical finishes used on textiles. Polymer backbone: A long chain of carbon & hydrogen.Reactions with other chemical groups, such as OH- in the environment, can release fluorinated side-chains to create new non-polymer PFAS.This is an organic chemical group (e.g. an alcohol, OH- group), that is more reactive than the carbon-fluorine bonds in the molecule, and allows it to attach to the polymer backbone.You could picture these as the ‘bristles’ of a comb, that stick up and create the water and oil resistant surface that resists stains. These non-polymer PFAS are just as persistent, but are more likely to be mobile, taken up by plants and animals, and therefore are of greater concern to the environment. PFAS is not a chemical, PFAS is a term used to describe a whole group of chemicals which are similar in that they contain a specific molecular structure, a ‘carbon chain’, and a specific element, ‘fluorine’. There are more than 3000 types of PFAS commercially available on the world market today. Polymers are substances consisting of a molecule (known as a monomer) that is repeated many times to create a long chain. E.g. synthetic plastics, silk, rubber. Polymer chain lengths are many thousands of molecules long.A 'backbone' of a hydrocarbon (C-H) polymer, with strands of fluorinated polymers attached, that stick up like the bristles of a comb. These are used to create water- and stain-resistant coatings. Fluorinated non-polymers are used as raw materials, or sometimes an ingredient to help the process of production (a processing aid), to make fluoropolymers and fluorinated side-chain polymers. Sometimes known as C8, Perfluoro-octane-carboxylic acid (PFOA) is one of the most studied PFAS. 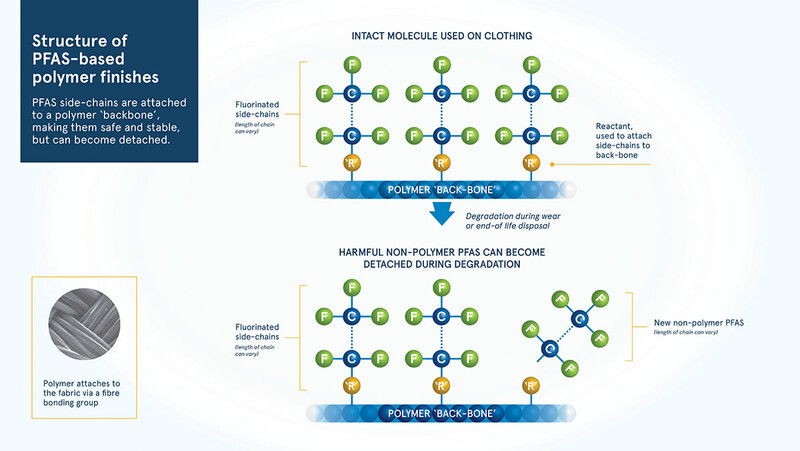 PFOA will be restricted by 2020 under European legislation because it is known to be persistent, bioaccumulative and toxic (PBT) in the environment.This was the original ingredient of Scotchgard, a fabric protector made by 3M. The use of this chemical is restricted globally by the Stockholm Convention on Persistent Organic Pollutants, because it is widespread and known to be harmful in the environment. Polymers tend to be very stable and do not easily break down in the environment. However, under certain conditions there may be exceptions. For example, the fluorinated side-chains that are connected to the main polymer backbone can sometimes react with surrounding chemicals or oxygen, releasing short-chain PFASs into surrounding environment. Fluoropolymers may break down to smaller molecules if heated to temperatures above 350 degC. PFASs can be split into either polymers or non-polymers. Whilst the terminology might bring back nightmares from school chemistry lessons, the concept is very simple. Poly- means ‘many’ and -mer means ‘segment’, polymers are simply molecules that are long chains made up of many segments. Non-polymers are all the rest. In ‘Fluoropolymers’ the unit that repeats over and over is a simple carbon atom with two fluorine atoms attached; PTFE for non-stick pans is based on fluoropolymers. The slightly more complex ‘Fluorinated side-chain polymers’ are used in textile finishes to give ‘stain resistance’ and ‘water repellent’ qualities. Fluorinated side-chain polymers start as a basic polymer ‘backbone’ (long chain of atoms), which as the name suggests, has ‘side-chains’ containing fluorine added along its length. The side-chains stick up like the bristles of a comb and act as a barrier towards oil and water. The length of the side-chains, and the nature of the polymer ‘back-bone’ are what gives each individual chemical it’s distinct qualities. The polymers used to produce textile finishes are not considered to be harmful. This is because polymers are not reactive and the molecules are too large to be easily taken in by the human body (they are not bio-accessible). This means there are no known risks to the wearer of stain-resistant or water-proof clothing (there is no need to strip off quite yet!). However, the polymer may breakdown into non-polymer PFASs. The non-polymers are also based on chains of carbon atoms, usually with a chain length between 2 and 13 atoms, much shorter than those of polymers. The infographic splits these non-polymers into a further 3 groups. The basic structure of these groups are the same, being primarily made up of carbon and fluorine in a repeating pattern, but the difference is that each group has another chemical group added (either a carboxylic acid, a sulfonic acid or an alcohol). The shorter chain means, compared to polymers, they are more mobile, reactive and more easily transferred into animals, where they can be found in small concentrations in blood. Non-polymers can be either a raw ingredient or a processing aid in the manufacture of fluorinated polymers. There is also evidence that under certain conditions polymers can break down to release non-polymers (although loss through manufacture is likely to be the greater source to the environment). It is the non-polymers that we know can be very damaging to the environment and to our health. 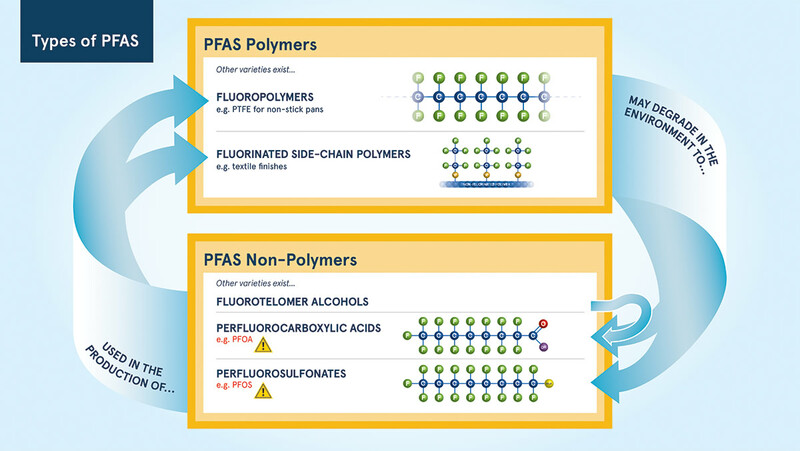 Until recently, PFOA and PFOS were the most commonly used PFASs in production of these side-chain polymers. They are the focus of the vast majority of research into PFASs so far and they are the ones that are heavily restricted or banned due to proven impacts on the environment and human health. One last distinction, a slightly confusing but essential one as it’s key to how industry is currently dealing with new and existing regulations. The non-polymers usually contain between 2 and 13 atoms making up the ‘chain’ part of the structure. Depending on the number of carbons, they are referred to as either ‘short-chain’ or ‘long-chain’. When people talk of ‘short-chain’ PFASs they are usually referring to non-polymers where there are 6 or less atoms making up the chain; long-chain refer to non-polymers where there are 7 to 13 atoms. Do not confuse ‘long-chain’ PFASs with polymer PFASs! PFOA and PFOS, are ‘long-chain’ PFASs with 8 atoms (sometimes known as C8 chemistry). Many manufacturers are switching to different versions with only 6 atoms in the chain i.e. C6 chemistry. These are not yet subject to any restrictions, but studies are more limited and their safety and environmental impact is less well known.